Our line of vent air fresheners is out of this world! 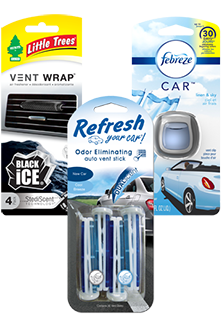 They are long lasting, great quality, with a variety of scents for your car. We have several brands including but not limited to; Yankee, Febreze, California Scents, and more. You have got to come and see our line of vent air fresheners! We have the lowest prices in the nation~GUARANTEED!